David Harker, director of the Center for Civic Engagement at Ithaca College, pictured working at the IC on-campus food pantry in the DeMotte Room of Campus Center. He was recently selected for the Engaged Scholar Initiative. David Harker, director of the Center for Civic Engagement at Ithaca College, was one of 12 faculty and staff members chosen from a pool of candidates from the Eastern Region for the 2019–20 Engaged Scholars Initiative. The initiative is hosted by the Eastern Region Campus Compact and aims to connect leaders involved in civic engagement on their various campuses to further develop and support initiatives to enact social change, according to the Campus Compact website. The scholars who were selected for the program come from 11 institutions of higher education on the East Coast and will participate in an 18-month program to develop, collaborate and expand on ideas to further develop programs of civic engagement on their campuses. 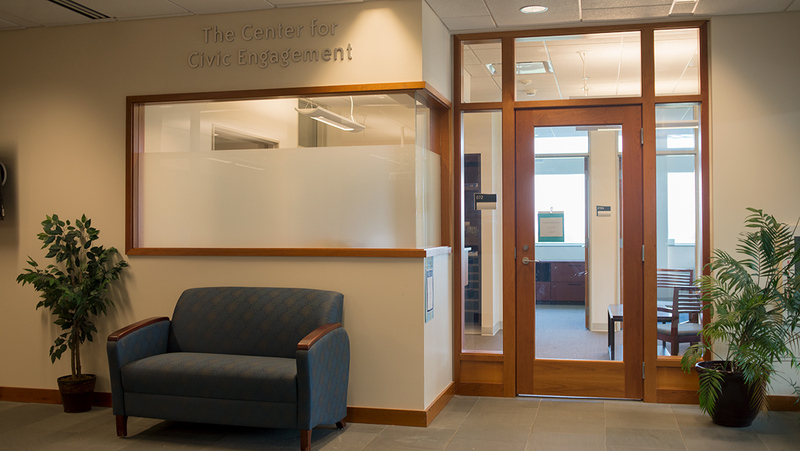 Staff writer Erika Liberati spoke with Harker about the program and how it will impact the college and the Center for Civic Engagement. Erika Liberati: What is the Engaged Scholars Initiative? David Harker: It’s a new program with Campus Compact the Eastern Region, developed with the National Campus Compact Office as well. We are the first cohort, although there was probably, about 15 years ago, another cohort that did a similar type of program that was the first class of engaged scholars. It’s to bring together early career folks working on community engagement. It’s half faculty, half staff or administrators, so there’s five other folks who work in similar center for civic engagement offices at a few other schools all over the East Coast, and then six faculty members. … It’s a really cool group of folks doing great work all over the country, and I’m really lucky to be a part of it. It’s really humbling to hear what other folks are doing and their backgrounds. EL: How were you chosen as a scholar? DH: I applied. So, we have a really good connection with the New York Campus Compact office. I know their director really well, and she shared the opportunity with me and encouraged me to apply just kind of knowing my background and my interests in this work and knowing that it’s really beneficial to have a cohort of folks doing things. … There’s also a research component to it. Everyone in the program is required to do research as part of the institute. … My proposed research project is to look at who are some of our students who are putting that into action and are kind of demonstrating the ideal result of service–learning and are really engaged with issues and kind of work back from there. EL: Will you get to finish the research as part of the scholar program? DH: There’s no set expectation. Timelines can be really different for research. I think the expectation is that you’re engaged in it while you’re apart of the program so you can bring that in to share with others. There’s no set expectation for publication during the 18 months that we’re in the program, but I think that the hope is that we’re doing research and accessing opportunities to share it. EL: What are your responsibilities as a scholar? DH: We each kind of bring our own position into that. There’s some of the faculty members that’ll teach a couple of courses that have a critical service–learning component to it. … The expectations for that are a little different for everyone because we’re bringing it in from our standpoint, but it’s that you’re engaged in the work in a very practical way on your campuses and you’re sharing that experience back with the group. EL: What does this honor mean for you personally, as well as the college? DH: It’s a recognition that we’re really at least thinking actively about and asking these same questions, ‘Why do we do this work, how do we do this work and how can we do it even better?’ For me, personally and professionally, it’s a huge honor to be a part of a cohort of folks doing this and learning from each other. If you look back at the cohort from 15 years ago, those are some of the leaders in civic engagement right now. It’s inspiring to think, ‘Oh, we’re the next generation of folks to be doing this work.’ It sets the expectations high, but that’s kind of exciting, too. It’s a great opportunity to learn from other campuses who are doing this and what challenges they are facing and how they address them and then be able to implement them back here. I think it’s a great opportunity to grow civic engagement. EL: Can you talk a little bit more about the work we have already done here at Ithaca for civic engagement and what you hope to accomplish as you go through these next 18 months? DH: I’ve been here for about two years, and I’ve realized how broad of a field civic engagement really is. The mission that we say is to provide a broad spectrum of opportunities for students to engage in the community, and I think we do that really well. We’re developing some new programs, reliving some other ones — we have great opportunities for students to engage in education, youth development, public health and medicine, aging and gerontology. EL: What do you hope to gain as a scholar? DH: I want to figure out how to take some of those next steps for us at IC. I think it’s a huge opportunity for us. I think it’s something we do well, but we’re well-positioned to really be a leader in this kind of work and being involved in these kinds of networks and opportunities, where we’re both sharing what we do, sharing some of our challenges, sharing some of the big picture questions and logistics. Sharing what we’re doing and learning from that, but also being apart of the broader conversation. Learning what other schools are doing, in particular, some schools that do this work really well and are nationally recognized for it.